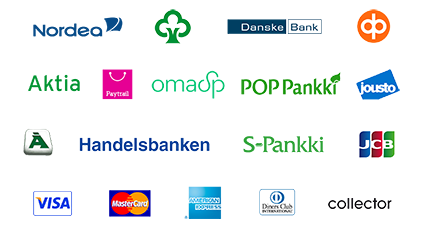 Accept Credit Card payments with Paytrail (formerly Suomen Verkkomaksut) secure card processing. A Paytrail contract is required, sign up now. Catalog currency must be set to Euro. Standalone extension which adds a CSS customizable buy now button on every product page with price set which points directly to secure Paytrail payment processing. With Order Form extension the gateway will add a card payment option in checkout. Established in June 2007 as ‘Suomen Verkkomaksut’. Their turnover has seen amazing yearly growth, enabling them to serve you better and better. They have over 50 experts, each one is a real gem. Their headquarters are in Jyväskylä, Finland. They are a licensed payment institution. They help 10 000+ webshops and online services in several countries to provide a pleasant shopping experience to their customers. More than two billion euros have passed through their system. They are part of Nets. They make online shopping easier, no matter where your customer is!